South of the majestic Taurus Mountains, lie the shores of the Mediterranean Sea with its beaches of fine sand, its vistas of uncommon beauty, its many ancient ruins, its hidden coves and alluring vacation getaways. Here history and mythology are inseparably intertwined and there are many legendary stories that prove this fact. Let us briefly share two of them. The monster Chimera, who spews fire out of his mouth, is supposed to have lived in the mountains west of Antalya. The Lydian hero, Bellerofontes, cut the monsters head off with his sword. Today, the fire which rises out of the ground on the southeastern slopes of Mount Olympus (Tahtali Dagi) is still said to be coming from the mouth of Chimera. The second legend is related to one of the unlucky love affairs of Apollo, the god of all the fine arts. Apollo falls in love with a beautiful girl named Daphne, but the girl is unresponsive to his overtures. One day while chasing Daphne in an area close to Antakya, Daphne’s feet turn into tree roots and her hands and arms become branches and limbs and she turns into a laurel tree, which is called ‘defne’ in Turkish. According to early sources, Saint Paul was born in Tarsus and the mythological Santa Claus was actually born in the town of Patara and lived and died in what is today Kale. The shores of the Mediterranean are just as full of antique artifacts as are the shores of the Aegean. In the ancient Lycian region west of Antalya, one may see the matchless beauty of the mountain cities, Termessos and Arikand, as well as the coastal towns such as Olimpos, Kale, Kekova and Kas. The ancient cities of Perge, Aspendos and Side are located on the coastal plain east of Antalya, which was called ‘Pamphylia’. Antalya is one of the Mediterranean’s most important cities and is Turkey‘s hottest vacation spot, with the Konyaalti beaches on the west and the Lara beaches to the east lying at the foot of Antalya’s massive mountain range. It is an attractive holiday getaway with palm-lined streets, beautiful parks, plentiful accommodation, restaurants, lots of night-time entertainment and a cozy marina. 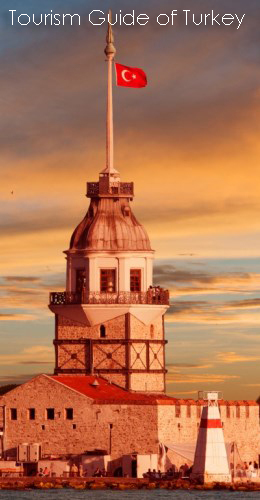 The symbol of this city, founded in the 2nd century BC is the Yivli Minaret, which dates back to the Selçuk era. The Asagi Düden Waterfall to the east of Antalya flows over huge boulders into the sea. West of Antalya is the cute little holiday town of Kemer, famous for its sandy beaches surrounded by pine forests and mountains. 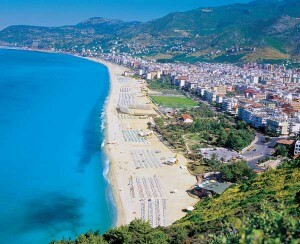 The next big town east of Antalya is Alanya, a panoramic port city on the southern slopes of the majestic Taurus Mountains surrounded with orange, lemon and banana groves. Used by the Selçuk Sultan, Alaaddin Keykubat as a winter residence, Alanya has a shipyard that dates back to the same era and was one of the most advanced in the world at that time. It is also famous for its 9th century castle and its charming beaches. Near Anamur is a castle from the Middle Ages. It is situated between two beaches and is certainly as magnificent as any of the castles along the coast. The road from Anamur to Silifke with its endless curves and bends follows a route studded with breathtaking coastal vistas. The dilapidated caves near Narlikuyu are called “Heaven and Hell” (Cennet ve Cehennem). The “Heaven” cave, which is quite large, also has a small church inside it. The castle of ‘Kizkalesi’, which is situated in the water across from the medieval castle of Korykos, seems to rise out of the sea itself. Two of the surprises which lie on the road to Mersin are Kanlidivane and Viransehir, two old Roman cities. With is charming parks, its beach boulevards, commercial port and free trade zone, Mersin is one of the most modern cities on the Mediterranean. East of Tarsus, the ‘Çukurova’ plain is a fertile agricultural region known especially for raising cotton. In the middle of this plain is found the city of Adana, a rich city with a large textile industry. East of this region is the Dörtyol (Issos) Plain where Alexander the Great defeated the Persian king Darius. As a result of his victory, a port city bearing his name was established and thus we have modern day Iskenderun. Leaving Iskenderun to the southeast, the road goes through the Belen Pass to Antakya (Antioch). This first Christian community founded by Saint Peter has given Antakya a special religious significance. The first sermons were preached in a cave outside the city. It is visited today by many as a site of pilgrimage. Antakya also has a mosaic exhibit of unusual beauty in its museum. Kahramanmaras is another province of the Mediterranean waiting “to be discovered.” Though its cuisine resembles in some ways the cuisine of the surrounding regions, the peculiar and often subtle tastes of the Kahramanmaras cuisine with its specially made orchid drink (salep), its world famous ice-cream of goat and cows milk and its various peppers, along with its gilded silver, leather and copper works, which were famous throughout the Ottoman empire, are still alive and offer a unique experience to visitors. After Alanya, Akseki is the oldest district in the province of Antalya, and has an appearance that befits its location in the rugged Taurus mountains, in a forested and very rocky area. The history of Akseki extends back to the Roman era, when it was known as Marla (Marulya), and has been continually inhabited until the present day. 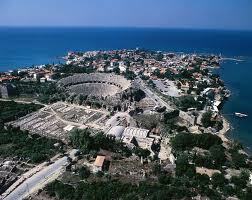 The developments in the tourism sector in the Antalya region in recent years have been seen in Akseki as well. The area is well known for the snowdrop flower, and every years sees local and foreign visitors coming every winter to see these flowers breaking through the snow, as the first sign of spring. The exact founding date of Elmali, which is located within the borders of ancient Lycia, is unknown. Excavations to the east at Karatas near the village of Semahoyuk, and to the west in the village of Beyler indicate that the area has been inhabited seen the Bronze Age. Tumuluses There are several tumuluses in nearby villages. The first is west of the city in the village of Mugren, on top of which sits a small fortress dating back to the Roman era. Surface-level archaeological research indicates that the area was inhabited in the Bronze Age by various civilisations. Another village to the west, Semahoyuk, has a tumulus but due to the fact that an Ottoman cemetery is located on top of it, no research has been done. The third and largest tumulus is in Beyler, south of the city on the Elmali – Kas road. Excavations conducted here show that the area has been continuously inhabited from the Bronze Age right up to the present time. The items unearthed in the excavations are exhibited in the Antalya Museum. Memorial Tombs There are tombs in Karaburun and Kizilbel. The walls of the King’s Tomb in Karaburun, on the Antalya – Elmali road, is decorated with frescoes of scenes of hunting and war. The tomb in Kizilbel is west of the city on the Elmali – Yuvayol road, and is a single room made of limestone blocks. Define Described as the Treasure of the Century, this was discovered in 1984, just north of the Antalya – Elmali road between the King’s Tomb and the village of Gokpinar. Consisting of 190 pieces of ancient silver coins, the treasure was smuggled to America by antique treasure thieves. It is still on display in the Boston Museum of Fine Arts as part of a private collection. The Athens Decadrachme, 14 pieces each worth US$600,000, is said to be the world’s most valuable treasure find. Located 67 km from Antalya, Korkuteli is surrounded by Antalya on the east, Burdur to the north, Mugla to the southwest and Elmali and Kumluca to the south. The effects of the Mediterranean climate can be felt here in this region of lakes but the further one goes inland, the more continental the climate becomes with cold winters and hot summers. There are numerous ruins of ancient cities in the district of Gundogmus, 182 km from Antalya. The important ruins are those of Hagiasophia city, 7 km north of Guzel Bag Bucagi, but no excavations have been conducted here. There are also the ruins of Asar at Sumene (7 km from the city centre), Kese (2 km east of the village of Senir) and Gedfi (11 km southwest of Gundogmus). Other places to visit in the area include the Cem Pasa Camii; the ruins on top of Sinek Mountain, 15 km east of the city centre between Gundogmus and Pembelik; and the ruins of Kazayir at Tasagir, on the Gundogmus – Antalya highway. Situated 180 km from Antalya, Gazipasa is a charming little town with a beach 10 km long, beautiful forests and turquoise blue coves. Iskele, the site of the Koru and Kahyalar beaches, is an important breeding ground of the caretta caretta turtles. Mostly undeveloped up until the present time, Gazipasa is on its way to being an attractive tourist centre with accommodation, recreation facilities, an airport and yacht harbour still under construction, as well as the natural and historical treasures of the area. Situated on the plane formed by the silt carried down from the mountains by Alakir Creek and Gavur Brook, Kumluca is surrounded by the towns of Finike and Elmali. In the upper reaches of Alakir Creek fed by the springs coming from Onemli Mountains and the Beydaglar Mountains, there are trout and striped mullet.